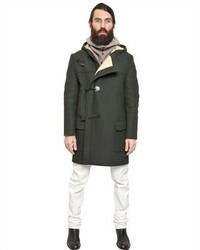 If you're looking for a casual yet on-trend look, go for an olive shirt jacket and Maison Martin Margiela white jeans. Both of these items are totally comfy and look great when worn together. 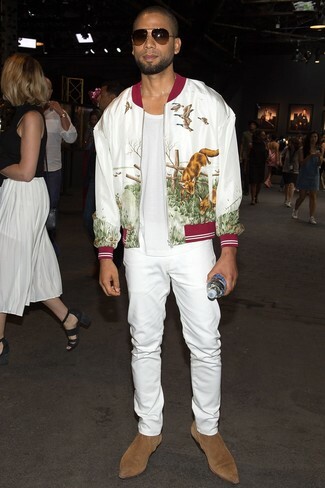 If you're looking for a casual yet sharp ensemble, pair a white print bomber jacket with Maison Martin Margiela white jeans. These two pieces are totally comfy and they also look great paired together. Amp up the cool of your getup by finishing off with tan suede chelsea boots. 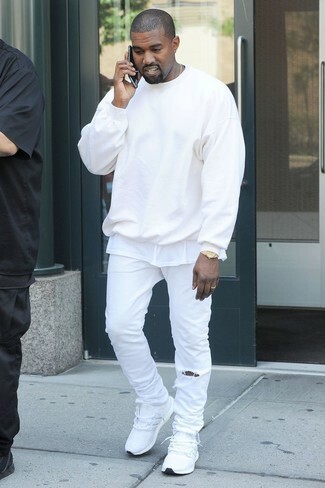 If you're on a mission for a casual yet on-trend getup, consider wearing a white crew-neck sweater and Maison Martin Margiela white jeans. As well as super comfy, these pieces look great together. Make white athletic shoes your footwear choice to make the look more current. Contrary to what you might believe, being a dapper dude doesn't take that much time. 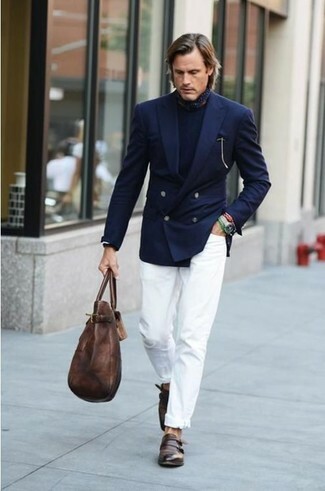 Just consider teaming a navy blazer with Maison Martin Margiela 18cm Stretch Denim Twisted Leg Jeans and you'll look smart. Up the cool of your look by complementing it with brown leather double monks. 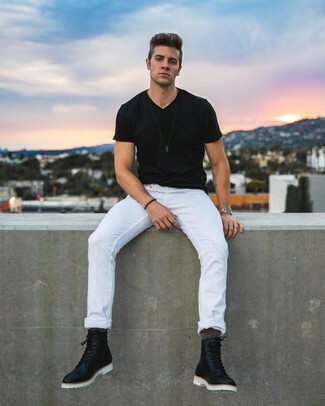 We all seek comfort when it comes to dressing up, and this combination of a white and black floral crew-neck t-shirt and white jeans is a great example of that. You could perhaps get a little creative in the shoe department and dress up your outfit with tobacco suede desert boots. 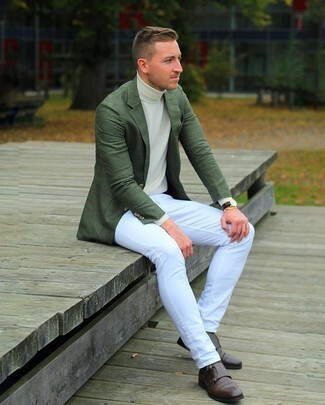 If you're after a casual yet seriously stylish outfit, dress in a light violet long sleeve shirt and white jeans. 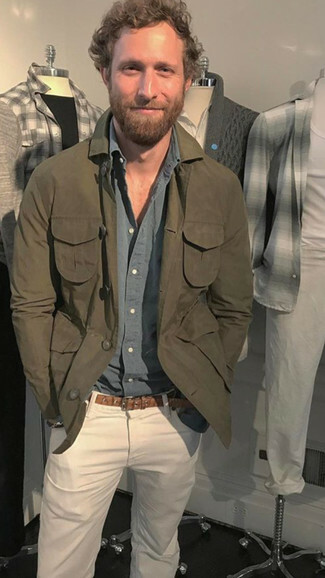 As well as very comfortable, these two garments look incredible when paired together. Dress up this outfit with dark brown suede loafers. 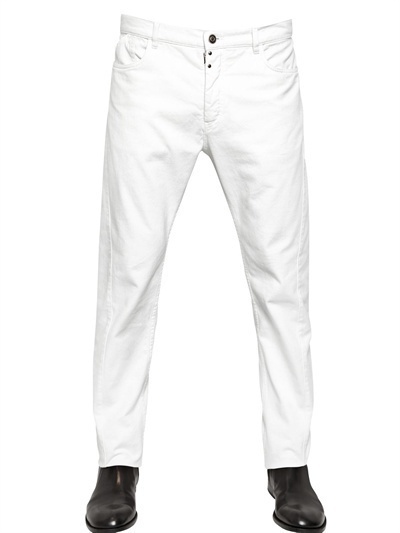 If you're scouting for a casual yet dapper getup, dress in a white short sleeve shirt and white jeans. Both garments are totally comfy and will look fabulous when worn together. If you're on the lookout for a casual yet stylish ensemble, pair a black v-neck t-shirt with Maison Martin Margiela white jeans. As well as super comfortable, these two items look fabulous when paired together. A pair of black leather casual boots will bring a strong and masculine feel to any ensemble. For a casually elegant outfit, go for a dark green blazer and Maison Martin Margiela 18cm Stretch Denim Twisted Leg Jeans — these two pieces go really well together. To add more class to your look, complement with dark brown leather double monks.